Lace up your boots, pull up your braces and help Bad Manners celebrate their 40th Anniversary! Heavyweight ska legends, Bad Manners were formed in 1976 in North London, and by 1980 they had refined their sound to incorporate the multi-cultural layers of Ska and 2-Tone. A product of Thatcher’s Britain in the 80’s where everybody was glum, Bad Manners brought an antidote of joyful Ska tunes and a big, big sound. The band were notorious for their on-stage party atmosphere and their memorable frontman, the ebullient Buster Bloodvessel, whose manic exploits got them banned from Top of the Pops. From 1980-1983 Bad Manners spent 111 weeks in the UK charts and have had 12 hit singles including; My Girl Lollipop, Lip Up Fatty, The Can Can, Lorraine, Walking In The Sunshine, Just A Feeling and Special Brew. Bad Manners appear at The Apex on Thursday 16 June at 8pm. 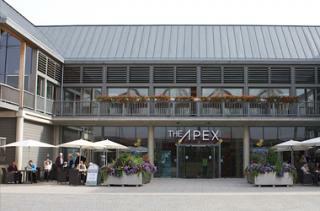 Tickets are £18.50 in advance (£20 on the door), call the Box Office on 01284 758000, or visit www.theapex.co.uk for more information, or to book your tickets.